Young brothers Christopher and Jess Hall seem to always be eavesdropping when they shouldn’t. When they peek inside their parent’s bedroom window one day and discover it’s not their dad who’s enjoying an afternoon delight with their mother, all hell-fire and damnation breaks loose. Although A Land More Kind Than Home reads a bit like a thriller, the plot never overtakes the development of the characters. And there are characters to spare! I was immediately drawn into the relationship between the two brothers: Christopher (dubbed “Stump” because he cannot speak) and Jess, the younger, who cares deeply for his older brother. I felt pity and frustration for the young naïve mother, Julie Hall, who wants to do the best by her family and her God—but is too easily swayed by sizzle over substance—and the snake-charms of a twisted preacher. And one can never forget the tired old grandfather, Jimmy Hall—racked with guilt and pickled in alcohol—who, nevertheless, has returned home to seek redemption. The story is told by three unique individuals: Adelaide Lyle, county conscience and former midwife—a salt-of-the-earth character you’d like to claim as your great aunt; the grizzled old sheriff, Clem Barfield, trying his darnedest to keep the peace while carrying a palpable grief from a long-ago loss (a perfect role for a younger Gene Hackman); and the afore-mentioned younger brother Jess, who, in the tradition of Scout Finch and Huckleberry Finn struggles to understand what’s going on around him while his life changes in the blink of an eye. Each brings his own perspective to the story, each reflects his own Southern dialect and upbringing in a fresh way, and we, the readers, are wiser for those contrasts. 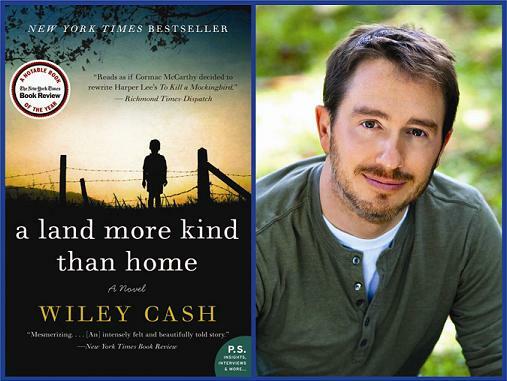 In addition to compelling characters, Cash does a great job of creating a sense of place—mid-1980’s rural North Carolina—through both the dialogue and the descriptions of the woods and countryside and the way of life of the townspeople. And of course, from the Sunday go-to-meetings, to the bizarre snake-handing services, one never forgets that we are firmly nestled in the everlasting arms of the Bible Belt. This is a great book for book clubs, with lots to discuss: good vs. evil; faith vs. religion—or what vile actions can be done ‘under the banner of heaven’; innocence vs. cruelty; parental responsibility; infidelity; alcoholism; loss and redemption—what more could one ask for? In the tradition of Flannery O’Connor, Harper Lee, and Pat Conroy, Wiley Cash’s Southern roots inform his writing—in both character and language. As this is his first novel, I think he’s a fresh, new writer to watch! ← Literacy and Hope: What you can. Where you are. Every day.